Diamond manufacturer brings a newly upgraded version of this T-shirt printing with heat press machine. 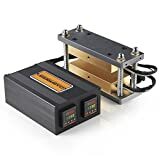 The incredible thing about it is that it can also be used as a rosin press because it manages to extract high-quality cannabis oil from the raw material. 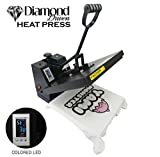 Other than that, you can, of course, successfully use this press for making all kinds of transfers onto T-shirts, bags, garments, mouse mats, ceramic tiles, plates and more flat surfaces. The pressing machine features a full-color digital temperature and time control. The color LEDs will display the perfect temperature time and a counter that’s useful when you need to know when the pressing process is over to avoid burning the material placed between the plates. 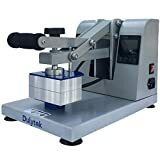 The pressing machine is not hard to use because it comes with a manual filled with very detailed instructions and photo illustrations to provide you a better understating on how it works and how exactly you should use it. The press is best used for the industrial and professional level. It comes with a really durable frame construction that it’s specially built for long-term use and high-performance. The silicone gel base board can handle up to 500 degrees Fahrenheit without having any issues due to the high heating. 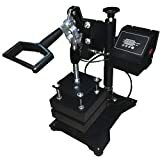 The machine also comes with a pressure-adjustable knob that is very useful for adjusting the pressure according to the material that you place between the smash plates. The dual electric system protection that’s included in the press offers you a safe operation without any risks. The manual of instructions is also filled with photos and all kinds of diagrams, and it will turn out to be very helpful for your safety as well. First of all, after I got the box and opened it, I was immediately impressed by the weight of this press. I was able to tell right from the very beginning that this device is not a toy and that it means business. 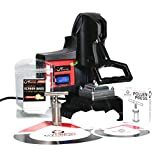 I bought it mainly for using it as a rosin press considering that I’m a cannabis oil enthusiast but I also used it to press tons of T-shirts for me and my friends as well. It was boxed up nicely, and it had Styrofoam inserts included in the box for enhanced care. These will also turn out handy in the future for storing the press machine when I’m not using it. Another feature that managed to stand out right away for me was the LCD screen. Once I plugged it in, the screen came to life, and it displayed some really vivid colors and sharp and easy to read details. The press machine excelled at heat transfers, but I was mostly impressed with the way that it managed to produce really high-quality rosin from any raw cannabis material that I used with it. I was thrilled that it didn’t burn and destroy my cannabis and the final result was excellent. I can’t complain about this T-shirt press at all. It heats up quickly, and each and every one of the five times I tested it to make rosin it completed the task flawlessly. When I used it for its primary purpose to make T-shirts, the timer went off at the correct time, and the shirts came out looking exactly the same way as the ones that come from professional shops. This press machine is effortless to use for both T-shirts and to produce solventless rosin. I would recommend it to both cannabis enthusiasts and people who are in the T-shirt printing business because it manages to do its task flawlessly. The sprayed Teflon coating and the coating from the heat plates with silicone rubber are very resistant, and these materials will provide your press an extended lifespan. 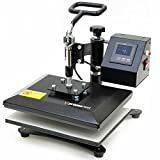 The clam-shell heat press machine comes with a digital temperature gauge that ranges from 0 to 499 degrees Fahrenheit. You will be able to operate the manual handle extremely easy. You can adjust the manual handle with the help of the pressure knob placed at the rear of the machine. The press features industrial strength and durability that will allow long-term use and high-quality final results. The press comes with a color LED digital time and temperature control useful for adjusting these elements according to the materials that you plan working with. The heating plate guarantees stable and even temperature distribution for a better result and for preventing burning. The aluminum heat plate will make sure that you’ll achieve the heating uniformity on the surface of the machine. The dual electric system protection offers a safe operation of the machine. Thanks to the integrated control system, you’ll be able to simply adjust pressure, temperature and time. This machine’s most apparent downside is the fact that it’s not a dedicated rosin press. Instead, it’s a T-shirt press. On the other hand, it manages to do the exact same job as a rosin press would and to extract the best cannabis oil from the raw material once you get the hang of how it’s used and once you inform yourself about the ideal temperatures and pressures needed to obtain oil from raw cannabis. Other than this, you’ll also be able to transfer photos on cotton, fiber, ceramic, metal, glass and more. This way, this pressing machine has multiple uses, and this is really great. You are advised to contact the seller directly for warranty information about this press. According to the manufacturer, this clam-shell heat press machine can transfer picture and words on cotton, fiber, metal, ceramic and glass. 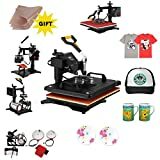 It’s also suitable for creating all sorts of gifts, and it can apply transfers, letters, numbers, and images to T-shirts, garments, bags, mouse mats, jigsaw puzzles, ceramic tiles, plates and other flat surfaced items. But most of all it can successfully be used to produce high-quality rosin by pressing raw cannabis.